What's missing? : Netizens familiar with the Republic of Singapore Air Force air defence shield may notice that a long-serving Ground Based Air Defence system is not in the diagram above. Guess which one. Minister for Defence Dr Ng Eng Hen: Madam Speaker, the member Mr Lim Wee Kiak has asked a highly relevant question as the relocation of Paya Lebar Airbase (PLAB) must never compromise the ability of the Republic of Singapore Air Force (RSAF) to safeguard Singapore's security and sovereignty. Indeed, this was the over-riding and primary consideration when MINDEF and the SAF studied the possibility of relocating PLAB. We were mindful that the current capabilities of the RSAF were achieved over four decades and remain critical to protect a small country like Singapore which lacks strategic depth. The RSAF's superior air defence and strike capabilities have been built up through prudent and steady investments of resources and land allocation for our defence needs. And over the years, we have acquired, adapted and developed advanced technologies and state-of-the-art platforms to provide more accurate and timely early warning and situational awareness of potential threats. We will continue to invest in these capabilities. In particular, the RSAF is putting into place a state-of-art multi-layered Island Air Defence System to provide a comprehensive shield protecting Singapore against airborne threats. This includes at the outer perimeter, our existing Gulfstream-550 Airborne Early Warning aircraft, which replaced our E2C in 2012, and significantly enhanced our early warning and air defence capabilities through its better endurance and longer range of detection. I would like to announce today that the SAF will also be acquiring the ASTER-30 Surface-to-Air Missile System. This missile defence system against airborne threats is used by advanced militaries such as France and Italy. The ASTER-30's capabilities are many times more potent than our current I-HAWK ground-based air defence system. The ASTER will allow us to engage multiple threats simultaneously and from a longer distance. It will complement the SPYDER, which we have already operationalised - it is a mobile, shorter-range, quick reaction ground-based air defence system - and together, they will provide a layered air defence shield. The RSAF will also be looking to upgrade its fighter fleet. We plan to upgrade our F-16s to modernise their avionics and extend their lifespan. Our F-15SGs were recently acquired and have proven themselves in recent multilateral military exercises with advanced Air Forces like those from the US and Australia during Exercise Cope Tiger and Exercise Pitch Black. Also, as announced at the Committee of Supply in March this year, we are evaluating the suitability of advanced multi-role F-35 Joint Strike Fighters in meeting our long-term security needs to further modernise our fighter fleet and replace our older aircraft. These advanced capabilities that I have mentioned have been built up through steady defence investments over the years, and have now provided the confidence for MINDEF and the SAF to consider relocating PLAB in the long term to meet national development needs. In 2011, MINDEF and the SAF conducted a thorough assessment of our capabilities and security threats for the long term. We satisfied ourselves that our security would not be compromised and that relocation of PLAB could take place after existing airbases at Changi East (CAB) and Tengah (TAB) have been expanded to accommodate relocated assets and facilities. The expansion of Changi Air Base and Tengah Air Base will be necessary to house relocated fighter and support squadrons as well as accommodate facilities currently housed in PLAB. As members would recognise, this undertaking is complex but the RSAF will use this opportunity to build anew through innovative operational concepts and advanced airbase designs, and this will enhance the effectiveness and resilience of our air bases. Newly expanded and improved airbases together with advanced fighter fleets protected by a multi-layered air defence shield will ensure that the RSAF maintains its deterrent edge and continues to be an effective and formidable Air Force. PLAB's relocation will be a long-term and complex undertaking. MINDEF will be working closely with MND on the detailed planning and implementation of the relocation over the next two decades. Thank you. Today's announcement that Singapore would replace its Improved Hawk (I-HAWK) surface-to-air missiles with the Aster 30 has overshadowed larger force modernisation projects for the Republic of Singapore Air Force (RSAF). Notable among these is the yet-unanswered question of where the RSAF's long-serving 35mm Oerlikon anti-aircraft guns have gone and what - if anything - will replace this low-level air defence system. The 35mm Oerlikons are conspicuous by their absence in the schematic above, which has inserted the contribution that Aster 30s will add to Singapore's integrated air defence system when the system has yet to arrive. The statement in Parliament (see above) by Minister for Defence, Dr Ng Eng Hen, outlines several big ticket RSAF initiatives. The staff officer(s) who drafted the speech did a good job sketching the strategic basis for a strong and evolving Third Generation RSAF ("lacks strategic depth", "early warning", "situational awareness", "multi-layered"). But the cherry on the cake would have been small mention - just a one liner would suffice - that the RSAF is marking its 45th anniversary this year. It would have reminded Singaporeans how far we have come in the past decades. The Parliamentary statement is, afterall, a major roadmap of the RSAF's future emphasis and direction. * A planned upgrade for the RSAF's Lockheed Martin F-16C/D fighter fleet. As the F-16 is the most numerous fighter type in the RSAF's inventory, the mid-life upgrade for our F-16s could turn out to be the biggest upgrade ever undertaken by the RSAF since the 1980s era A-4 Super Skyhawk project. The scope and scale of the work for the RSAF Air Combat Command - AESA radar, black boxes for integrating F-16s into the Singapore Armed Forces battlenet - is likely to generate keen interests among defence players for a piece of the action. The announcement is timely as organisers of next year's Singapore Airshow 2014 go into the last mile to persuade aerospace and defence companies to set up shop at the biennial airshow. * Expansion of Changi Air Base and Tengah Air Base. Base infrastructure is set to grow at Tengah - presently the RSAF's largest fighter base - while a new Changi Air Base (East) will rise from a greenfield site at the future Changi Airport Runway 4, outside Changi Naval Base. Having the RSAF give up Paya Lebar Air Base will release military airspace west of Changi Airport's Runway 1. The net effect of this enormous volume of airspace would allow Changi to cope with increased air traffic in decades to come. Compared to warplanes and combat helicopters, air bases are unsexy and do not stir one's loins in the same way as an F-15SG Strike Eagle thundering off WSAP on full reheat. But the Ministry of Defence (MINDEF) and SAF planners understand why the RSAF stood up its Air Power Generation Command in the first place. Today's statement underlines Singapore's willingness to follow through with investments needed to generate and sustain air power. * And now back to the MBDA Aster 30s. English language grammar specialists - and there are a good number who visit this site - would recognise that Dr Ng used the future tense for describing the Aster 30 purchase. He said:" I would like to announce today that the SAF will also be acquiring the ASTER-30 Surface-to-Air Missile System. This missile defence system against airborne threats is used by advanced militaries such as France and Italy. 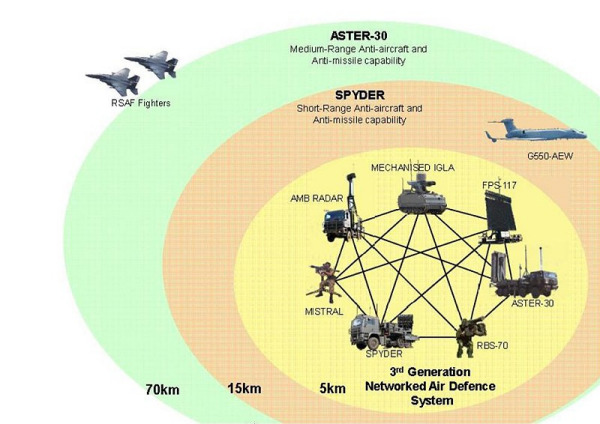 The ASTER-30's capabilities are many times more potent than our current I-HAWK ground-based air defence system. The ASTER will allow us to engage multiple threats simultaneously and from a longer distance." His statement indicates that the I-HAWKS will remain in service in the interim (a no-brainer), as no time frame was mentioned for the Aster 30s to take over from the I-HAWKS. The 70-km range Aster 30s will give the RSAF Air Defence and Operations Command (ADOC) the reach and killing power to enlarge the sphere of contested airspace around Singapore. To this Ground Based Air Defence System, one might add the contribution of the Republic of Singapore Navy's Aster 15s - a Sea Based Air Defence System? - which could further extend the outer edge of ADOC's range rings. When the Aster 30s turn operational, a decision to add the squadron to the Integrated Air Defence System (IADS) maintained by forces from Australia, Great Britain, Malaysia, New Zealand and Singapore under the auspices of the Five Power Defence Arrangements (FPDA) is likely to boost air defence coverage of peninsular Malaysia. When one uses today's statement to telescope RSAF capabilities into the future, what one sees is a determined effort by our defence planners to make investments that will give the RSAF the numbers, the reach, the sustainability, lethality and technological edge that represent the air force's contribution to deterrence. It is indeed encouraging to note that our defence planners have thus far steered clear of buying trophy armaments that look good in a flypast, positively spiffy on parade, but have little fighting value. We fight as a system. And the system of systems that the future RSAF will command should be a sight to behold. Y no announment on iron dome? I hope they buy Russsia S400 in future. David, think you may not have parsed the reply sufficiently carefully. "The SAF will also be acquiring [...]". Not the RSAF, but the SAF. Separately, future tense. "Be acquiring". Hur hur hur. Good spot by CJ that the Rapier is not in the picture (presumably replaced by Spyder). Neither are 160's 35mms. Does this mean that the RSAF already have the ASTER-30 and that the SAF will also be acquiring the system in the near future? seems to be this confusion about RSAF/SAF. SAF = Singapore Armed Forces = Army, Navy, Air Force combined. Therefore when the Minister says SAF as a whole, it has no relevance whether it refers to RSAF, Army or RSN. SAF is not the short form for the army. The army has no acronym. Anyway...Aster30 is likely to be already operational by RSN, onboard the 6 stealth frigates. Their Sylver A50 launchers have always been capable of launching those, albeit only publicly announced to carry the Aster15 (shorter 30-km range version of the same missile). It is so laughable and moronic of those pappies. You have coming to fill more than half the population of SinCity with foreigners everywhere in the ground of Singapore, and yet those clowns can throw gigantic amount of money trying to fight enemy in the air ? How disillusion can those clowns get ? These expensive toys will have been disabled and overtaken by the enemies in the ground before those weapons can even put into use. they really think enemies are stupid enough to engage them in the air for supremacy where all it takes is to disable those facility from the ground ? Singapore has really no future under those clowns enjoying comfy millions dollar job from ivory tower. Aster 30 max range is 120KM. RSN already operate Aster 30 on board Formidable class. In Aug 2013 issue, a defense analyst mentioned that more F-15SG will be procured in batches. Other platforms due for replacement are KC-135R, Fokker 50 MPA, Challenger SSK. September 17, 2013 at 8:00: Sure, these Pappies are not ruling over an ideal country. But as long as no one stands up to them, they can do what they want. They are getting rich. These systems protect their wealth from external threats. They have other means of protecting against internal ones. Cheers. What saddens me the most is that they had the audacity to announce the acquisition on LKY's birthday. There were 364 other days they could have. I'm sure LKY knew way in advance of the decision, but it gave him the satisfaction that a message was sent out that he still calls the shots in this little village of his. September 17, 2013 at 9:54 PM: It was confirmed recently that 12 further F-15SG were ordered. Defense is a sacred topic in Singapore. But i feel that even the sacred need to be questioned in order to ensure we get the best bang for buck for our investments. How much will the planned upgrade to ASTER cost? What criteria have we evaluated before confirming to go ahead with the ASTER family? How interoperable are these compared with the other assets of the SAF, such as the ASTER 15/30 currently operated by the RSN? Will the current system be capable of supporting the ASTER 45 if it is deemed necessary in future? How will the existing Skyguard and iHawk be phased out after the ASTER system has been purchased? Has there been any operational issues from the current users of the SAMP-T, such as France and Italy? What is the effective range of the ASTER 30 if used in a land based environment? According to Wikipedia, it is supposed to reach 120km maximum. The minister's speech had stated 70km, can the minister clarify on the difference? We are glad that the RSAF will be seeking an upgrade to a AESA radar for our F16s. Can the minister pursue initiatives to allow a transfer of know how so as to enable our own GLCs to build and maintain the radar sets? Can the minister study into alternative fighters while we are evaluating the F35 as well. Recent news have informed that the South Koreans will be purchasing from Boeing the F15 Silent Eagles. Can we incorporate into the Mid Life upgrade study of our F16, to see if such capabilities can be done with lower cost? I'm not surprised that the SAF are getting SAMP/T, the French cut their order by two batteries, so there's production capacity. The system commonality with the Navy must have been a major consideration, and there's the 'diversity of source' factor. The Rapiers, I-Hawks and 35mm were obselete two decades ago, while Igla has a pretty low pk. RBS70 can be upgraded to Bolide, which gives it the same range as Rapier (8km). For the F-16 MLU - it's interesting that the minister's announcement comes less than two months after Lockheed selected the SABR AESA radar for the USAF F-16V upgrade programme, the same upgrade that the ROCAF is considering for its Falcon upgrades. Sharing what I can, RBS 70 has been upgraded to BOLIDE, and SHORAD is getting rid of Giraffe for a new toy. All these talk about weapon fail to answer how we are going to defend ourselves against Chinese surface to surface ballistic missiles when China gets into a war with USA ? China's strategy is to protect its sea access to oil and the Straits of Malacca is still an important chokepoint for them. During war with America, their priority and option is to take out force American friendly bases in Japan, Korea, Taiwan and guess what, Singapore. At the end of the day, all these billions of dollars invested in new toys will not serve much of a deterrence function against China's new longer range missiles to reach SG and beyond, aircraft carrier, submarines, or for that matter even Malaysia's Astro II multiple rocket launcher. Singapore should stop fetishizing about new weapon toys and invest the money instead in social welfare. I support everything the government has announced except the F-16 AESA upgrades and the F-35. These are very expensive items that are focused on enhancing Singapore's air to air capability, in an environment where it is already unmatched by a large margin, both for now and very far into the future. We have got to a point where further air to air capability does not save soldiers' lives. LHL needs to learn the meaning of "reasonable sufficiency" because this expenditure is getting out of hand. The missile defence acquisition is one purchase which makes a meaningful impact and to which I have no objection. As for the LKY reference, alluding to the fact that The announcement was made prior to his bday equals a secret sign to the people? Sheer lunacy. I can't fathom those idiots who link everything back to being a 'pappie'... What a waste of oxygen on this planet. And for those who want transparency as to every military purchase and justification for every upgrade? Are you serious? Showing all your hand to your opponents before the game? What figures in their logic circuits? 1. We face no more than 24 barely equipped Su-30s and 8 old F-18s, all flying out of vulnerable bases. For any country to order, introduce and operationalise a new fighter will take years, even-assuming that they wage war in concert against us. You have stretched the complacency argument to illogical extremes. What kind of targets will your AESA-equipped F-16s and F-35s will have to shoot down? None whatsoever. We should wait some years before upgrading the F-16s. The fact that our RSAF was less strong historically did not see us invaded. 2. Yes, some people have made a reference to pappies. Do you classify all who disagree with the government as being anti "pappie"? This dismissive attitude towards anyone not in White is what turns even supportive people against the government. Someone cited grounds for deferring the upgrade and you called him an advocate of complacency. Why so defensive? "So many short-sighted commenters who seem to be too happy to rest on our laurels. Why upgrade any further when we already have the edge? Such thinking is how you lose the edge! As if buying a platform like a toy off the shelf is the way the defence industry works... Maybe in certain northern neighbour countries... :P"
yes, your english may be very good and your question may be very good but still "where is your brain" ? Your thinking can only think linearly like pappies. Kee Chiu and Yes-man kind of thinking without regard to the context of the ground and changing landscape. It only can be our educated pappies are the smartest and enemies are daft. Good luck to you. Guys, this was getting to be an interesting GBAD thread with air superiority thrown in. Can we get back to that without the flames and politics please (and don't anyone - chk out my vocab - start quoting Clausewitz!)? Fetishizing about new air weapon systems is the same as fetishizing about the latest iPhones. Do you think these newest iteration of fancy named toys will do the deterrence job if China decides to strike Singapore in a conflict with America ? Singapore is a pawn in the looming America-China conflict. The only important question is who put us there in the first place and do we still want to be caught in this big power conflict cross fire? Well, if Singapore is going to be such a vital base to America in such a conflict, America will take it upon itself to defend it appropriately. America will rely on other bases in addition to Singapore, for prudence sake. In fact in practical terms, due to limited space and collateral damage concerns, Singapore may not be as ideal as other bases once their facilities are developed/rehabilitated, which takes a short time if China turns up the heat. In addition, politically, I believe Singapore will play a secondary role firstly because this path is open to Singapore given that claimants will be eager American hosts, and secondly because 40% of the population will be naturalised or resident Chinese. We are talking about building physical facilities for US forces, not about host nations building up their own capabilities which takes much longer. These will be defended by deployable land and naval BMD. Then again, these are no more useful than our Asters against Chinese anti-ship ballistic missiles if they indeed exist. Presently I think the most effective weapon among SEA against Chinese carriers are Vietnamese fighters and Vietnamese and Malaysian sub launched anti ship missiles. I know some people will be dismissive, but Chinese ASW is not at a level to counter it yet. Singapore will probably acquire these soon but it is presently not necessary because our capabilities to sink any regional navy are strong enough. Just a simple count of confirmed changes we will see in the SAF in near future years. Compiled from announcements. Please add if I have missed any out (confirmed items only please). Probable order of 12 more F -15s soon, (mentioned in a recent DSCA FMS notification) specifications unknown. Possible F-35 announcement in a few years.
" Just a simple count of confirmed changes we will see in the SAF in near future years. Compiled from announcements. Please add if I have missed any out (confirmed items only please)." Weird. If you have all the money to buy the most expensive and sophisticated weapons in the world, why aren't we having professional soldiers to operate these weapons rather than using nsf soldiers. A food for thought. If you have more professional soldiers, they are more in tune to provide better and realistic feedback on the weapons acquired, after all that is their profession. Where to find so many people in Singapore want to become pro in Army hallo? Air base concentration not a problem since realistically, most of Singapore is within range of even short range artillery systems. In any case, looks like some gaps in defense layer if Oerlikons are gone. Spyder covers medium to short range but think we could benefit from Iron Dome and likely either MANTIS or CENTURION gun systems for mortar fire that could easily complicate base operations. Fort those who think we are wasting money on these systems, think back to Israel's Northern cities more recently where nuisance missiles (inexpensively put together) from non state actors provided a real threat to security for the average citizen. Yeah better if the money was spent on social welfare but a necessary evil it is particularly with the lack of strategic depth we have. Command of air is absolute necessity. To me somehow more runway better than less mah. Hope at least they keep the existing Paya Lebar runway for emergency. Most of our taxiways can be used as taxiways. I believe I counted on Google Earth a total of 17 potential runways including Changi airport, Tengah-UAV, Seletar and Sembawang. Excluding Sudong and public roads. If F-35B acquired, every 200m of straight road = possible runway. No need PLAB liao. F35B...I think this is a key factor. Game changer. Damm ugly bird though. "Endurance 160 LHD purchase (David Boey's dream ;) )"
Let us name the vessel RSS Tin Pei Ling.
" Where to find so many people in Singapore want to become pro in Army hallo? hello, if you paid them well and give them a career path, why no people joining, after all it is still a profession and specialized skill with opportunity to train overseas ? many join PAP because of $$$ , and did you ask "where to find so many people in singapore to join PAP ?" please consider that possibility rather then just reject straight out like what the establishment do. Other countries with similar size like singapore and as prosperous can do it , why not us ? What stopping us from doing it ? "Fort those who think we are wasting money on these systems, think back to Israel's Northern cities more recently where nuisance missiles (inexpensively put together) from non state actors provided a real threat to security for the average citizen. Yeah better if the money was spent on social welfare but a necessary evil it is particularly with the lack of strategic depth we have. Command of air is absolute necessity." At least have some common sense. Did you see the imminent and ongoing threat that Israel is facing in Singapore ? Did you see Israel open the floodgate to foreigners like what Singapore do ? Command of air is useless if the facility has been disabled in the ground (just look at how fragile these communication in singapore are , like in singtel fire and disruption). What make you think the enemies are so stupid to engage in the air for supremacy ?